Why are they doing these things? Because, as CEO Steve Rendle puts it, of a “…retail backdrop that continues to experience disruption and consolidation, particularly here in the United States.” No kidding. CFO Roe says during questions that he expects “…continued consolidation …over the next five years,” and notes that “…we’re not expecting much on a net basis from wholesale in the U.S.” over that period. A focus on expense control and distribution to improve margins and strengthen your brands at a time when sales growth is (and, I think, will be) harder to come by while building your balance sheet so you can afford to take the actions you need to, well, control expenses and improve distribution when sales growth is hard to come by is a strategy most industry companies are employing right now. It’s also the one I’ve been pushing for coming on ten years, so sorry to be repetitive. Interestingly, that could practically be the end of the article, but I suppose we should take a look at the numbers. VF’s revenue fell 2% to $2.58 billion from $2.63 billion in last year’s quarter. Direct to consumer revenues rose 6% and accounted for 29% of total quarterly revenue. International revenue was 43% of the total. SG&A expenses rose 3.3% from $0.972 to $1 billion for the reasons explained above. The gross profit margin increase couldn’t offset the decline in revenue and the rise in SG&A spending, so operating income fell 6.7% $312 to $291 million. Income from continuing operations after taxes declined 11.2% from $242 to $215 million. After discontinued operations, net income was down 19.6% from $260 to $209 million. The discontinued operations are the Licensed Sports Group, which VF has agreed to sell for $225 million, and the JanSport collegiate licensing business they have decided to sell. JanSport was part of Outdoor and Action Sports. The balance sheet is good, but I’ll point you at a couple of things anyway. The current ratio rose from 1.5 to 2.1. But mostly that resulted from short term debt being replaced by long term debt. Except for that, other categories changed very little from a year ago. Debt to total capital rose from 34.2% to 37.2%. 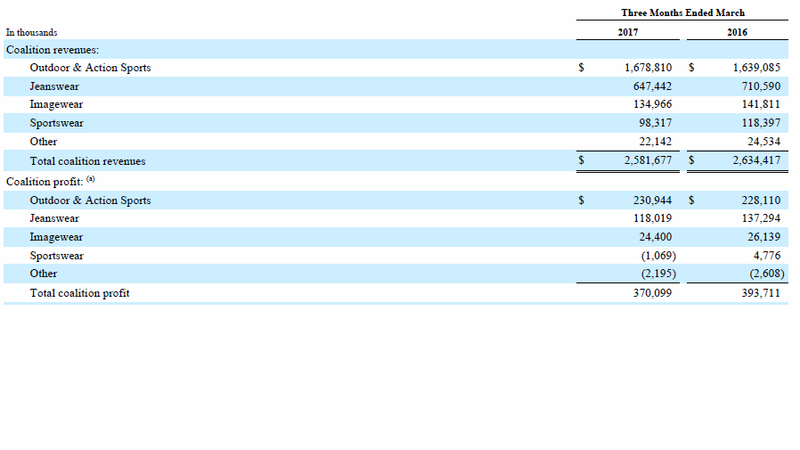 Next, let’s dig into their revenues and operating profit by coalition, as they call their business segments. I’m guessing you noticed that Outdoor & Action Sports is the only segment that had an increase in revenue and operating profit. Its revenue rose 2.4% and operating profit, 1.2%. An operating profit improvement of $16.8 million in the segment was offset by a currency loss of $14 million. The revenue growth numbers above for Vans, The North Face, and Timberland of 5%, 6% and -5% respectively are directly from the 10-Q. In CEO Rendle’s opening conference call comments he says, “For the quarter Vans, The North Face, and Timberland grew at a combined rate of 4% with strength in The North Face and Vans, which grew 8% and 7% respectively.” Timberland, we’re told later in the call, was down 4%. Those numbers are different from the 10-Q and I have no idea why. Perhaps rounding and an allowance for currency? He doesn’t say. Wish he’d explain. Working with the conference call numbers for a moment, if the three largest brands were up 4% overall but the coalition was up just 2% during the quarter, then apparently the other brands in the Outdoor & Action Sports segment, cumulatively, had a lousy quarter. Those other brands are Eagle Creek, Eastpak, Kipling, Lucy, Napapijri, Reef and Smartwool. The other segments all fell at both the revenue and operating income levels except that the smallest segment, “Other,” reduced its loss. Good thing Outdoor & Action Sports represents 65% of coalition revenue and 62.4% of coalition operating profit. I’m kind of wondering what happens to VF if Vans and/or The North Face hit a rough patch. I don’t think any brand keeps growing forever like Vans has been growing. But don’t listen to me- I can’t believe the stock market is still going up. Here’s VF dealing with the same tough market that everybody else is dealing with and taking many of the same actions. Their size, strong balance sheet and what I believe to be their disciplined management processes are allowing them, right now, to manage their way through this. There was a time not that long ago when I would have added balanced portfolio to that list of strengths. That’s changed as Outdoor & Action Sports has become such a big chunk of their total business. They’ve done a tremendous job with Vans and The North Face. Timberland appears to still be a work in progress and some of their smaller brands in that coalition are apparently not doing too well. VF continues to be interested in larger acquisitions, and it would be good for them to find one at the right price that could provide some balance to Vans when the inevitable stumble occurs, whenever that is. Portfolio Theory at Work at VF; Their Quarterly Results.